A look at NYC in the 19th century. Tiny Stuyvesant St., crossing E. 9th St. between 3rd and 2nd Aves., is notable for being the only diagonal street in Manhattan north of 8th St. and south of Central Park except Broadway. 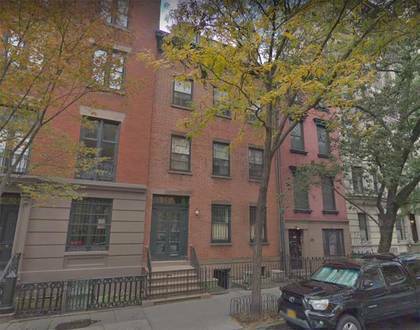 (We’ll leave Greenwich Village out of it, since it’s always had its very own street system quite independent of the gridiron imposed by the Commissioners’ Plan (Randel Survey) back in 1811.) As in most exceptions to the rule, it has its own story to tell. 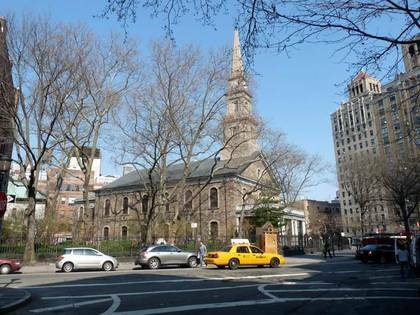 The northeast end of Stuyvesant St. affords a view of St. Marks-in-the-Bowery, an Episcopal church built in 1799 (the steeple dates to 1829). The difference in dates accounts for its melding of three different architectural styles, Federal for the church, Greek Revival for the steeple, Italianate for the portico, added in 1854. The burial vault of Peter Stuyvesant (1612-1672), the last Dutch Director-General of New Netherland, can be found in the churchyard. Though Stuyvesant died nearly a century before the church was constructed, his family owned property in the area including a farm and a chapel. Daniel D. Tompkins, New York governor from 1807-1817 and US Vice-President from 1817-1825, is also interred here, as is Philip Hone, NYC mayor from 1826-1827 and later a prolific diarist. The church was nearly destroyed by fire in 1978, but was rebuilt by the mid-1980s. I think Stuyvesant, a strict Dutch Reformist, wouldn’t be thrilled to know he rests on property that derives from the Church of England. 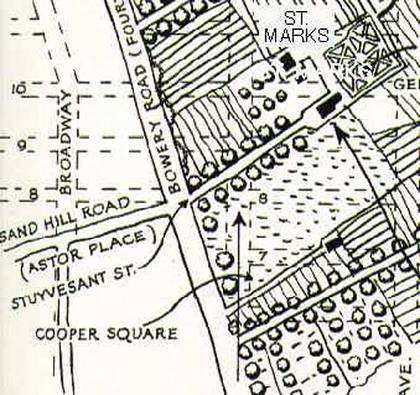 Peter Stuyvesant’s holdings extended roughly from what is now Cooper Square north to E. 23rd St. with the western boundary at the Bowery Rd. (now called 4th Ave.) and the eastern boundary in a line between what’s now 1st Ave. and Ave. D.
This close-up of a map in Kenneth Dunshee’s excellent history of early New York, As You Pass By, shows a narrow lane leading from the Bowery Road northwest to Gov. Stuyvesant’s manor house, which remained with the Stuyvesant family until it burned down in October 1778. His great-grandson Nicholas was the last tenant. The lane exists today as Stuyvesant St. But why, and how, did it survive from Peter Stuyvesant’s day? Petrus Stuyvesant, Peter Stuyvesant’s great-great-grandson, owned most of the land in this area and his mansion, called Petersfield, was located in the block between 1st Ave., Ave.A, and E. 15th and 16th Sts. It was Petrus Stuyvesant who laid out a street system and donated land and construction funds for St. Mark’s, which was completed in 1799. The area around Petersfield, extending west to the old property line at the Bowery Rd., became known as Bowery Village in the early years of the 19th Century. Stuyvesant St. is the last survivor of a village grid, laid out by Petrus Stuyvesant, that existed prior to the overall street grid adopted in 1811. The streets were named for Petrus’ sons and daughters, Peter, Judith, Margaret, Nicholas William, with a couple of other street names thrown in. As New York City expanded ever northward as the 19th Century rolled on, Bowery Village was incorporated and most signs of it, with the exception of St. Marks-in-the-Bowery, gradually disappeared. But Stuyvesant St. had by then become a well-established thoroughfare and so was allowed to remain after the Commissioners Plan has eliminated most of the other odd roads that would have interrupted the grid. (For example, Petersfield St., which extended from the Bowery Rd. at about 11th St. to the Petersfield mansion, was eliminated when the cross streets of today were cut through). The Nicholas Fish-Elizabeth Stuyvesant House, 21 Stuyvesant. As the historic plaque explains, it was constructed in 1804 by Petrus Stuyvesant as a gift for his daughter when she married Revolutionary War hero Nicholas Fish, who served with Washington at Valley Forge and at age 18 is still the youngest Major in US Army history. He was associated with Treasury Secretary Alexander Hamilton and the Marquis de Lafayette, whose military expertise helped win the war. Lafayette visited NYC in 1824 and was entertained in this building. Nicholas and Elizabeth’s son Hamilton was born here in 1808. He went on to serve as US Senator, Governor of New York, and US Secretary of State under U.S. Grant. The Fish name has long been prominent in New York State politics. I had long believed that St. Mark’s Church and the Nicholas-Fish House were the oldest buildings on the block. 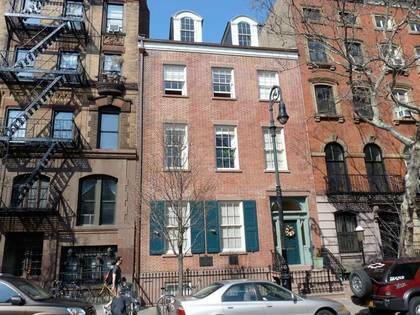 However, 44 Stuyvesant was built in 1795 for Nicholas William Stuyvesant, according to the Landmarks Preservation Commission, and is one of two remaining houses that belonged to the Stuyvesant family from the immediate post-Revolutionary era. Only the Morris-Jumel Mansion in Sugar Hill is an older residential building on Manhattan Island. It carries no historic plaque and blends in well with the surrounding buildings, which go back to the 1840s-1850s. 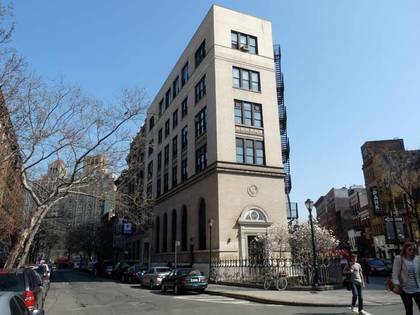 The Hebrew Technical Institute, founded 1884, occupied the building at the fork of Stuyvesant and E. 9th Sts. (#34-36 Stuyvesant) until 1939. The name of Edgar Starr Barney (1865-1938), a longtime principal, is emblazoned above the doorway. After completing two years at the school, students could specialize in wood-working, pattern making, metal working, instrument making, mechanical drawing, architectural drawing, wood carving, free-hand drawing or applied electricity. The school was founded with the combined efforts of three Hebrew charity organizations that formed a committee to assist the many Jewish immigrants arriving in NYC in the late-1800s. 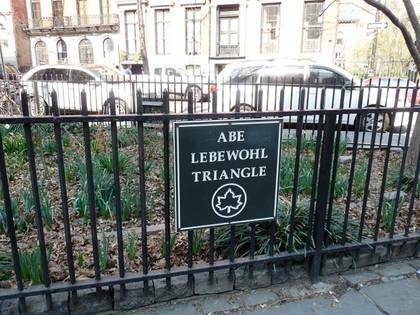 Finally, on a sad note, Abe Lebewohl Triangle, Stuyvesant St. and E. 10th St. The longtime owner of the 2nd Ave. Deli (he founded it on the southeast corner of 2nd Ave. and E. 10th St. in 1954) was shot and killed in an unsolved robbery on March 4th, 1996. The deli closed at its original location, but later reopened in two Midtown and East Side locations, 162 E. 33rd St. and 1442 1st Ave.